The Burns Family in Eatonton, Georgia, knew exactly what they wanted when they decided to remodel their home overlooking beautiful Lake Sinclair. One of the primary goals was to maintain and enhance existing lake views and create new vistas by adding a sunroom. The family turned to JKJ Architects, headquartered in Rogers, Arkansas, to design the renovation. JKJ Architects and the contractor, Oconee Interiors Commercial & Residential Design, decided that by using aluminum framed folding glass walls from NanaWall, they could achieve this goal – and more. An experienced architect, Mack chose NanaWall because it was the market leader. “I talked to a contractor who had already installed one, and he raved about how easy the installation and operation of the window were,” Mack relates. The client also had heard about the brand, adds Mack: “Bill Burns already knew about NanaWall’s reputation, as he was in the construction industry.” In fact, the Burns had assumed JKJ would use NanaWall all along. An entry pathway was part of the renovation, bringing visitors from the gallery to the kitchen, which is the heart of the house. “Upon entering the home, I wanted an immediate connection to the lake, and the openings in the kitchen allows visitors to experience the lake views as they approach the kitchen-living area,” says Mack. The newly renovated sunroom, which is affectionately called the “NanaWall Room” by the family – is an ideal entertaining room: comfortable seating, two flat-panel televisions, and a cathedral ceiling. 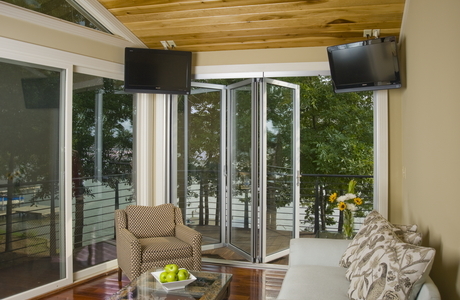 There is a NanaWall installation on either side of the sunroom; a small step down leads to the wraparound deck. Through one SL60 one reaches the outdoor fireplace, and through the other one can see more views of the lake. 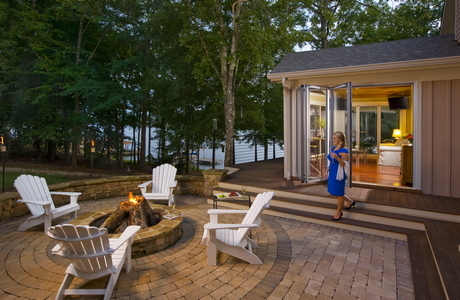 At the heart of the circular patio is a flagstone fire pit. A circular wall built with the same stone provides privacy for the patio, and protection from the escarpment to the lake. 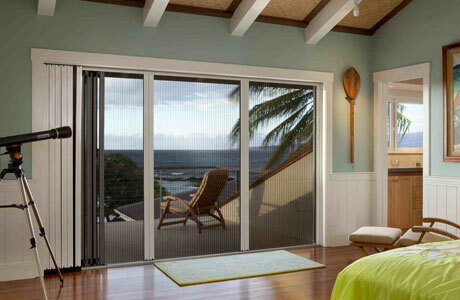 The NanaWall SL60 helps maintain consistent interior conditions when closed. The thermally broken, aluminum folding-panel system is appropriate for residential applications where high levels of air- and water-infiltration resistance are needed. In this way, NanaWall folding glass walls contribute to sustainable architecture through high performance, as opening the doors allows natural ventilation in mild weather. In colder months, the NanaWall glass panels bring in natural daylighting but offer excellent weather resistance and energy efficiency. Each NanaWall has a swing door option, which is convenient when the Burns want to leave a wall closed. Mack loved using NanaWall, so much so that he recently suggested replacing a 16-foot fixed greenhouse window with a NanaWall system. He looks forward to installing another system in the future because “it does something that is unique” – including long spans wall of up to 36 feet.